Heritage has combined with cutting edge technology recently to provide a solution for cleaner exhaust systems. Leyland Bus Parts, a company that traces its history back to the bus building days of Leyland Bus, has joined forces with GreenUrban Technologies Ltd, a designer and installer of the latest exhaust filtration systems. The pair-up combines the latter’s expertise in developing green exhaust equipment with the former’s experience in selling components abroad. Chris Peat spoke to Leyland Bus Parts General Manager, Andy Lawson and Commercial Director, Ian Lowe, to find out how this partnership came about and how it has benefitted them. GreenUrban’s and Leyland’s collaboration came about when a Hong Kong bus operator required a product to help reduce its vehicles’ emissions. Leyland was approached by the bus firm and in an effort to win the contract the parts supplier sought a company that provide emission reduction equipment. After a search throughout the industry, GreenUrban was found to be the provider of choice, with Andy describing the business as ‘small, but technically aware of the equipment it provides’. The firm has ‘good pedigree,’ he said, pointing out that one of the Directors used to run the technical centre for Leyland Trucks, so his commercial vehicle technical knowledge is ‘excellent’. The technology GreenUrban could provide was just what the customer required and the partnership was formed, with Leyland using its knowledge and skill in exporting automotive equipment to get GreenUrban’s product out to the operator. DPF and SCR retrofit exhaust systems to the Hong Kong operator were successfully fitted to 23 trial Volvo Olympians and Dennis Tridents. Initial performance results from the equipment were beyond original predictions. They must have proved successful as a further 23 units have been ordered and at the time of writing are all but fitted. The systems’ installation on the city’s buses was supported by funding from the Hong Kong government. The unit fitted is the ecoNOxt product, which combines a Diesel Particulate Filter (DPF) and Selective Catalytic Reduction (SCR) solution to reduce emissions from Euro1 to Euro4 vehicles. This combination produces a system which reduces legislated diesel engine emissions, Oxides of Nitrogen (NOx), Particulate Matter (PM), Hydrocarbons (HC) and Carbon Monoxide (CO). It can ensure Euro2 or Euro3 buses meet Euro5 or EEV standards, reducing PM by 90%, NOx by 80% and hydrocarbons and carbon monoxide by over 90%. Its manufacturer also claims it can achieve 5% to 15% fuel savings. The retrofit solution is designed to provide significant reductions in black soot particulates (PM) and Nitrous Oxide (NOx) emissions at a fraction of the cost of a new vehicle or even a re-power exercise. The idea is that it gives added life to vehicles that would otherwise become obsolete due to their current emission standards despite having many years of service life remaining. The project involved a number of visits to Hong Kong to ensure the engineering team gathered all the necessary data from the operation and mapped this against the system to ensure optimum performance. Andy said that in theory, any good mechanic can fit the systems. However, technicians were flown over from the UK to Hong Kong to assist the operator’s local fitters, ensuring the units were installed correctly for optimum performance. 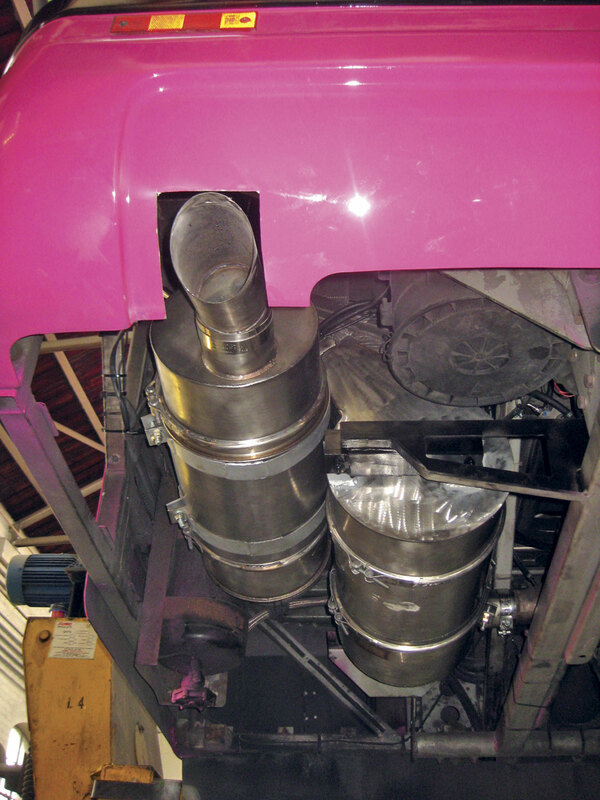 GreenUrban’s exhaust system is available to all operators. It is important to note that its solution is not necessarily as described above, it can be modified to customer requirements. For instance, if a client asks for a less extensive system than the combined SCR and DPF unit, then the company can provide just a retrofit ecotrap DPF system. These ecotrap units can be periodically cleaned, therefore achieving a longer service life. They will clear up most of the visual pollution, the smoggy clouds, but particulate matter (PM) will still be present in the fleet’s emissions. If aiming to reduce PM too, then the ecoNOxt is advised. In terms of his company’s latest partnership with GreenUrban, Ian said he is hoping for more of the same success. Leyland Bus Parts supplies bus components across the globe, working with its international supply partners, many of whom are major multinational corporations with which its relationship goes back many years. GreenUrban is a relatively new business compared to its fellow partner company. 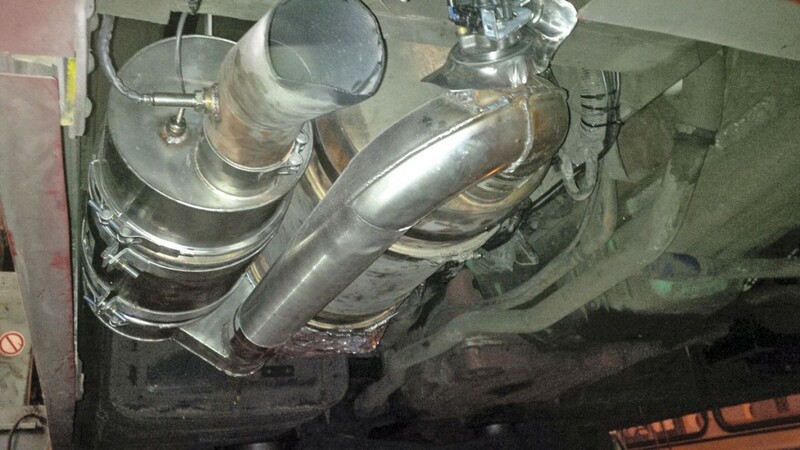 It was founded in 2004 to offer cost effective exhaust solutions to the commercial vehicle industry. It believes lowering emissions should also help to lower operator’s costs. Initially based in Cheshire, the company moved to Cumbria in 2010, relocating to a new, state of the art manufacturing facility in readiness for the introduction of the 2012 Low Emission Zone in London. The company has grown to employ over 20 people across the UK. Cleaner air is a huge focus for many cities world wide, with the need to improve emissions of passenger transport fleets becoming an environmental priority. This is not just the case in far flung places like Hong Kong, but closer to home in London and other UK and European cities with NOx targets they must legally comply with. London is leading the way, proposing even stricter emission standards with the planned Ultra Low Emission Zone. Part of the solution may be alternative drive systems but using GreenUrban Technologies’ systems will accelerate the pace at which our cities worldwide can improve their air quality.